The 4th Annual Washington Gardener Magazine Photo Contest kicks off! The 4th Annual Washington Gardener Magazine Photo Contest kicks off now! Time to start sorting and picking out your best 2009 garden shots. Entries are due by January 22, 2010. • Garden Vignettes: Groupings of plants in beds or containers, unusual color or texture combinations, garden focal points, and still scenes. 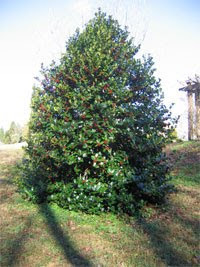 My article on Maryland's Native Hollies that was published in the December 09 issue of the Takoma Voice, Silver Spring Voice, and Kensington Voice is now available online as a PDF. And yes, I survived this weekend's blizzard and managed to get the Washington Gardener Magazine Winter issue to the printer before the storm hit. Now I'm alternating rounds of shoveling with updating our mailing list, booking speakers for all my 2010 events, and getting the last of my Christmas prep done. December issue of Washington Gardener Enews features Winter Containers, Seed Exchange Details, Lewis Ginter Gardenfest of Lights Contest, and much more! It is the 15th of the month, which means Garden Bloggers' Bloom Day again. To view links to other garden bloggers' blooms and read their collective comments, go to http://www.maydreamsgardens.com/. It has been a soggy, frigid past four weeks. Not great for keeping blooms on any of my outdoor plants. Even on my pansies they turn to a messy mush, but I went out this morning and found these four precious blooms -- two roses and two sweet peas to share. I direct sowed the sweet pea seeds into my vegetable bed on a whim back in September. They are kind of spindly, but are hanging in there. The roses are single blooms on my Meidiland grouncover shrubs. Those usually bloom in clusters and are also normally done by October. The rest of these rose bushes are covered in rosehips. I tasted a rosehip both before and after the freezes here in the DC-region last week. I can definitely attest to waiting until after a freeze to harvest your rosehips. The sugars really come out with the cold. Before the freeze, the rosehips are a bit bitter. After it, they are almost as sweet as apples. I'm deciding if I should leave them out for the wild life or if I should harvest some to attempt some home-made Christmas presents. My schedule may dictate that more than anything. Today I'm getting our Washington Gardener Enews done and sent out, tonight is the annual DCEcoWomen holiday gathering, then I have to get the Winter issue of the Washington Gardener Magazine final layout plus proof done for printing later this week. Next comes processing the new subscriptions and entering the magazine's mail list. Wondering when I'll ever get my present shopping done and tree trimmed. Luckily, I'm done with my cards and cookie baking already. Can you believe there are only two weeks left in 2009? Not sure yet how I feel about the dyed Poinsettia trend. I'm on the fence. (I know, can you believe I don't have a strong opinion on this of all things?) Tacky, yes, but really, aren't almost all Christmas and holiday decor items pretty much way over the good taste line? I'm going to give these a pass. If they make you happy, buy them. If not, you'll live and these poinsettias will soon be dropping their funky-colored leaves and in the compost heap by New Year's. According to http://www.ecke.com/ (poinsettia marketers extraordinaire), December 12 was "set aside by an Act of Congress as National Poinsettia Day. The date marks the death of Joel Roberts Poinsett, who is credited with introducing the native Mexican plant to the United States. The purpose of the day is to enjoy the beauty of this popular holiday plant." That last sentence cracks me up. It is just so painfully awkward in wording and concept. So set aside your chores today, folks, and just sit and stare at your gorgeous poinsettias. LOL! Many of you who know me personally, know I'm a movie addict. Seeing three films a week in the theater is not unusual for me. If I add cable/DVD movie viewings, my weekly average would be about 7, I'd guess-timate. Loving movies as I do and seeing so many, it is easy to compare and contrast especially in their treatment of my favorite hobby and the #1 pastime in the world by over-whelming numbers: GARDENING. So what did 2009 bring us onscreen? Well, let's talk bad first and get that out of the way. The worst landscape of course would be The Road. A truly life-changing, must-see film and book. It is a desolate, bleak version of our future. Hardly a seed survives the unnamed ecological disaster that brings on the end-times. Yeah, depressing, yet oh so compelling. My pick for best movie of the year. My award though for worst garden depiction goes to Everybody's Fine. *sigh* This film COULD have been so good. The movie's main character, a retired widower father, is a die-hard gardener after all. However, in the first 10 minutes of this flick, gardening is disparaged 3 times. Basically, it is implied that gardening is for old cronies with one foot in the grave and an awful snoring bore. We see the dad out in his North Carolina garden which he meticulously tends doing cruel things to his neighbors shrubs that dare peak over their shared fence. The fact that his window boxes are filled with FAKE flowers is another alarming element. Then there is the depiction of anyone over 50 as an utter idiot and technophobe. I won't spoil it for you should you go, but trust me, if I was in that age-bracket it'd get my hackles up. Insulting and the AARP should take note and sue. What gets this my WORST award though is the movie's depiction of powerlines/utility poles. These obscenely ugly scars on our landscape are shown over and over in long, loving cinematic shots. We are supposed romanticize how these lines connect us all. All I see is a blight on our national face. If the film was better, I suppose I could forgive all this. It is about the level of a bad Lifetime special. Skip it and get the Italian original instead Stanno Tutti Bene. Now for my award for BEST and just squeaking under the 2009 wire as it officially comes out on Christmas Day: It's Complicated. Fellow Gardeners, run, don't walk, to the theater and SEE this. 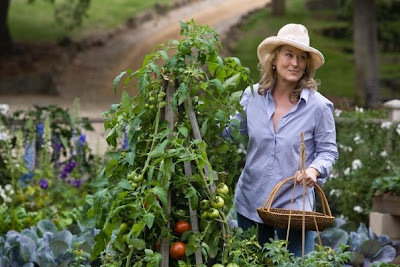 You will get hints of Meryl's character's marvelous garden at her Santa Barbara, CA home throughout the film, you see it at the edge of several scenes. Getting to know her, you just know it is coming. Her children: angelic darlings. Her ex: a cheeky, charming child-man. Her new beau: sweet as pie. Her restaurant: warm and inviting. Her wardrobe: straight out of Chico's catalog. Her hair: care-free and colored just so. Her home: a dream with a seaside view. Her cooking: drool-worthy. Her friends: supportive and hilarious. You just KNOW her garden is going to be to-die-for. No garden on film has ever equaled this one. Rows of perfect cabbages, carrots, and beans -- everything bug- and blight-free. Impossible in real life, but who cares? You want to hate her, but damn, how you want to BE her. This film is will do more to sell gardening than a thousand Michelle Obama photo ops. Relish every minute of it. "We are not out to establish a rate base by giving stuff away to sell ads against," she says. "Our magazine numbers that we deliver to advertisers are real numbers, and they are premium numbers. They are paid, and there is nothing gimmicky about it. So if you buy an ad in one of our publications, your ad goes to readers that have paid for that magazine and are excited about it." Yes, yes, and yes. Free or "controlled circulation" publications are not the answer and many is the freebie publisher I meet at networking events who regrets that decision and tells me how they envy our subscription base. You can read the whole interview here. •Cooking - candies, liquors, breads, desserts, Spanish paella, and other food from practically every culture. Personally, I love saffron because it is used in many of my favorite Indian dishes. •Medicinal - cancer suppressant properties, antioxidant, antidepressant, mutation suppressant properties, protects the eyes, and general healing. Saffron has been linked to the healing of over 90 illnesses! •Other purposes - fabric dye, perfumery, general food coloring. •Saffron's history reaches back 4000 years. •One pound of saffron requires 50,000 to 75,000 flowers - the growing area equivalent to a football field. •One pound of saffron would cost between 500-5000 US dollars depending on the grade (color, taste, and fragrance). •Plant new bulbs in the very early autumn for bloom around October. To begin with, try planting about 2 dozen. •Crocus sativus will thrive in full sun, with loose well-watered and well-drained soil (what wouldn't??). •Bloom period is about 1-2 weeks. •Be sure to catch the blossoms when they open. Most blooms will last one day and will wilt as the day passes. •Pluck the 3 orange-red stigmas in the center of the crocus sometime in the mid-morning on a sunny day when the bloom is fully opened. •Let air dry then store in an air-tight container. •Steep about 1 teaspoon saffron in about 3 teaspoons of hot water or broth for about 2 hours. •Add both threads and steeping liquid early in the cooking or baking process. •Buy threads, not powdered saffron. The powder could be cut with turmeric, a cheap spice that imparts a similar color. It may be cheaper, but will require more to be used for the same flavor impact. •Sometimes saffron is dyed to give that red color cooks want. This is not good. You want to look for the real thing - the saffron thread should be red, but the tips should be slightly lighter in color. Wendy Kiang-Spray is a blogger and gardener in Rockville, MD. She is a high school counselor by day and a landscape architect and master gardener by night in my dreams. This is BUY LOCAL DC Week and Washington Gardener Magazine is featured in the Washington City Paper guide to supprting the local economy. See http://www.washingtoncitypaper.com/shoplocal/ for all the wonderful local businesses you can visit online and in person to take care of all your holiday shopping this year. Last Friday, the Gardening With Kathy Jentz: December Chores segment aired on WAMU 88.5 Metro Connection Show, with repeats over the weekend. It is posted online now here: http://wamu.org/programs/mc/. In a week or so, it will move to the Archives area of the radio station web site and you'll just need to search on "Jentz" for that segment link and all the older ones to pop up for you. You can save a stamp and a paper envelope by bringing your renewal, new subscription, or gift subscription orders and payment to me in person this coming week in the heart of WDC. I'll be helping my brother out at his "Jentz Prints" booth at the DC Holiday Market. Come by to see me on Mon 12/7, Wed 12/9, and Fri 12/11 from 10:30am-12noon. Look for booth #4, which is close to the 9th street side of the market and very near the mini doughnuts. Just follow the heavenly smell. 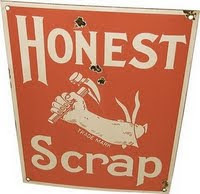 This past weekend, I found out that Wendy Kiang-Spray of http://www.greenishthumb.net/ blog fame selected me for the "Honest Scrap Award." I did a Google search on it and I'm not sure where it started, but the idea is that you share honest bits of information about yourself. The award has two components. You have to first list 10 honest things about yourself (and make them interesting), and second present the award to seven other bloggers. - I have been watching All My Children since 1978. Yes, I was 10 years old when I got hooked on the Nina and Cliff love story. I think Erika was on only her 3rd husband at that time. - I creeps me out when I go to someone's home and they have no pets, plants, or books. It feels like a hotel or furniture showroom -- empty and cold. - I wish I was born either 20 years earlier or later, my generation (Gen X) really got the shaft. - I'm an eco-green nut, but my greatest luxury is long, hot showers. - I sincerely believe that the Beatles, U2, and Michael Jackson are seriously over-rated. - I won't sleep in any hotel room above the 12th floor. - I'm a proud and unrepentant re-gifter. - I don't judge people on their cars, clothing, neighborhood, etc. but I sure will judge them and quite harshly on their taste in comedians and movies. - I think my cat is cuter than your baby. - I don't mind at all (and sometimes prefer) going to the movies myself, but I dread going to sit-down restaurants alone. Our new Washington Gardener Magazine editorial calendar, advertising details, and promotional opportunities are now posted in this easy-to-read PDF. We are always open to outside-the-box partnering as well. Contact us anytime to discuss your ideas.